One advantage to this never-ending Winter we are having in the Northeastern part of the United States is the focus – and extra time – it has given me in finishing my Winter projects. After completing my recent Classic French Jacket, I did some “birthday dress” sewing for my granddaughters (still to be shared) and made two baby gifts, and only then did I come back to making a matching sheath dress for that jacket. I had thought long about how this dress should be constructed, and not having the advantage of taking a class in such a project, I knew I would have to figure it out on my own. I decided I would combine classic couture construction with the techniques used for making a classic French jacket. 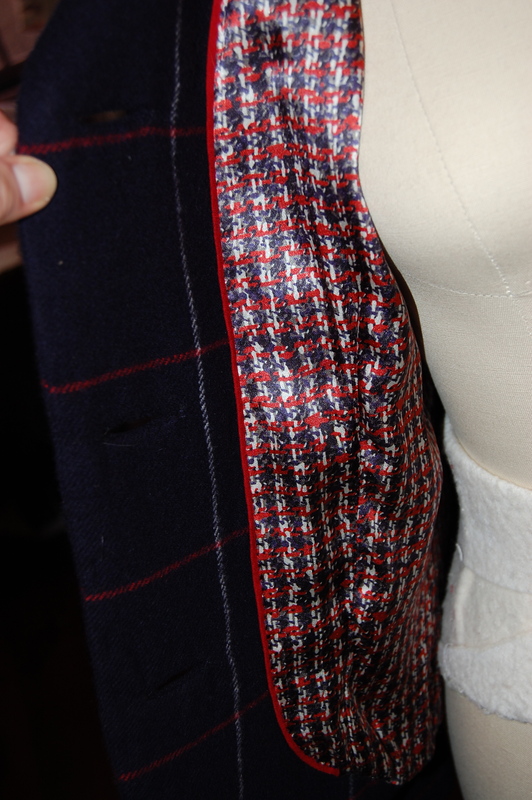 The three pieces were sewn together as a Jacket would be sewn with the edges of the lining loose and then finished by hand with a fell stitch. At this point I felt fairly confident that the dress was going together as I had hoped. And yes, there is a lot of handwork involved! Next I inserted the long back zipper by hand and then finished the neckline and lining with a fell stitch. Because I wanted to apply a length of trim above the bust – to match the trim placement on my jacket – I did the armholes last, as the trim needed to be attached before they were finished. Finally, the hem. The length had to be precise, as there will be no lengthening nor shortening of this baby! 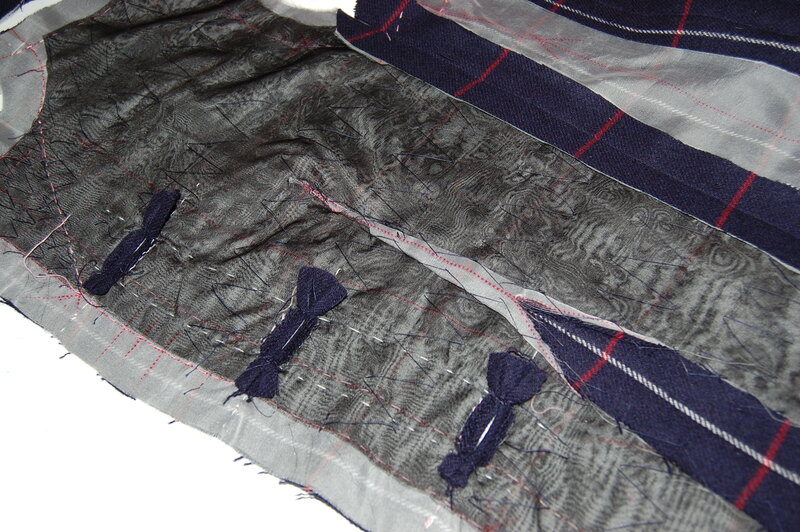 The final step was to sew the hemline trim on by hand. I delineated the back vent with the trim to give it some extra interest. Also, although it is not visible here, I angled the edges of the vent slightly to the inside so that when the dress is on, the vent will not gape, but rather hang straight. This is another one of those lovely couture tricks I learned from Susan Khalje! I must say this dress is a dream to wear, with that quilted silk interior. And – I am quite happy with how it looks with my jacket. As warm as this dress and jacket are, I was freezing when these photos were taken! I have faith that Old Man Winter – who is truly ancient by now – will soon leave us, but not without a fond farewell from Fifty Dresses who appreciated his extra encouragement on seasonal sewing! Every once in a while, a unique opportunity comes along in the form of fabric. We all know those times – when the end of the bolt is just the amount you need, or a single bolt of one-of-a-kind designer fabric comes to your favorite store, or a long-awaited re-order makes possible your dream of owning that exact piece. For me, it was an offer from a reader of my blog. She had two pieces of vintage wool which had belonged to her aunt, dating from probably the late 1950s or very early 1960s. Once I saw swatches of both fabrics, I immediately saw the possibilities inherent in each one, and the colors were not only yummy, but also ones that I can wear well (a fact which was correctly noted by my dear reader.) I purchased both pieces well over a year ago, and ever since, I have been dreaming about sewing with them, starting with this gray (what I believe to be) coat-weight cashmere. 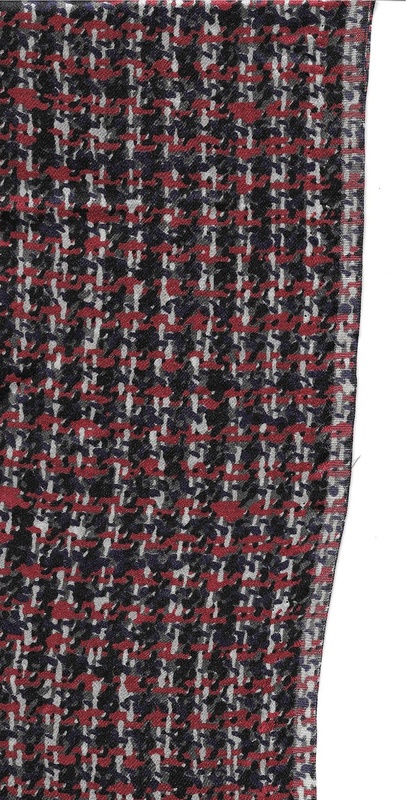 The top part of the photo shows the right side of the fabric. It has a soft, luscious nap to it. The contrast of the weave on the underside is hopefully discernible. As luck would have it, I had already picked up some swatches of (new) wool challis and various dress-weight silks one of the last times I was at Mendel Goldberg Fabrics in New York City. It did not take me long to pair this Swiss challis with the gray wool. The gray in each little square is a perfect match to the cashmere. I will definitely be accenting my outfit with something in this color. Armed with this send-off, I immediately began to look in earnest for a coat pattern. 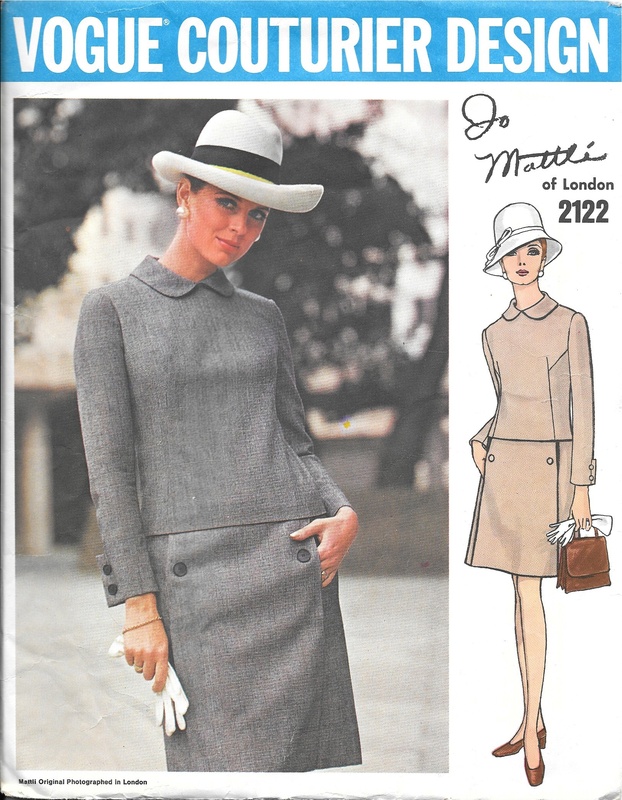 I did not want to purchase the wool challis before I had a pattern, but my thought was to line the coat (except for the sleeves, of course) with it, and then make a coordinating dress or blouse as well. 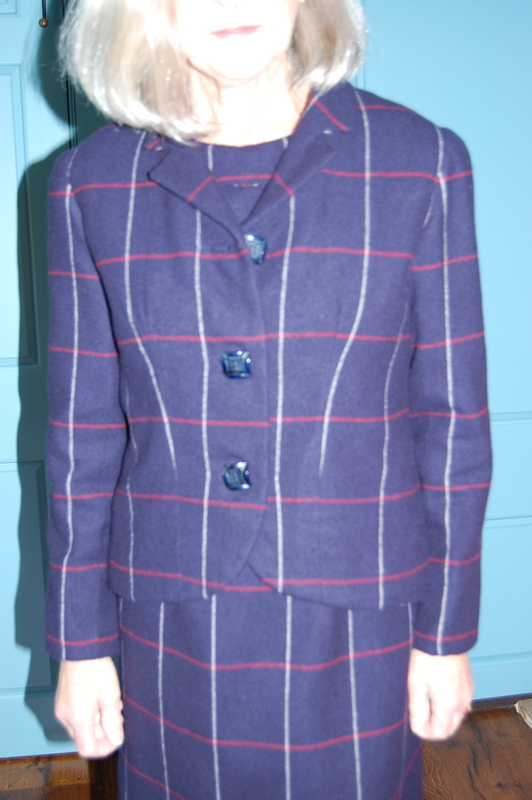 When I found this Guy Laroche coat (and dress) pattern, it seemed to be just what I was looking for, even though when I purchased it, I knew that the pocket flap pattern piece was missing. I was confident, however, that piece would be easy to recreate. The collar of this jacket extends so that it can be looped. 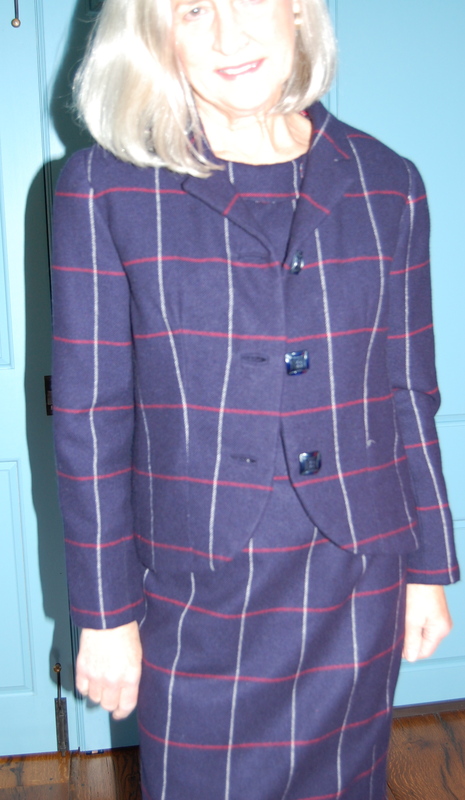 The diagonal direction of the weave in the top part of the coat is a lovely contrast for the rest of the ensemble. Once I had my pattern, I ordered the wool challis from Mendel Goldberg (still in stock, thank goodness!) Now, at this point, I did not know exactly how much to order. The body of the coat will be lined in the challis, while the sleeves will be lined in gray Bemberg. I couldn’t go by the yardage on the envelope for the lining since I was “mixing it up.” I think I may have enough of the gray cashmere to make a skirt, but the fabric might be too heavy for a skirt. I’ll know more once I start to sew with it. The rambling on in my head told me that I needed to get enough of the challis to either make a long-sleeved blouse to go with a “maybe” skirt – or enough challis to make an entire dress, as well as the coat lining. So – I ordered PLENTY!! Now I have options. 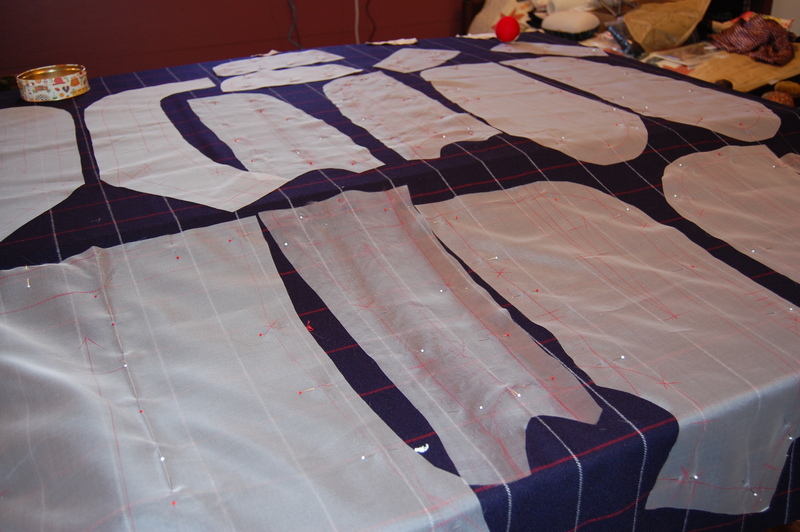 The main body of the coat really has just 8 pattern pieces (the facings you see are for the dress included in the pattern.) 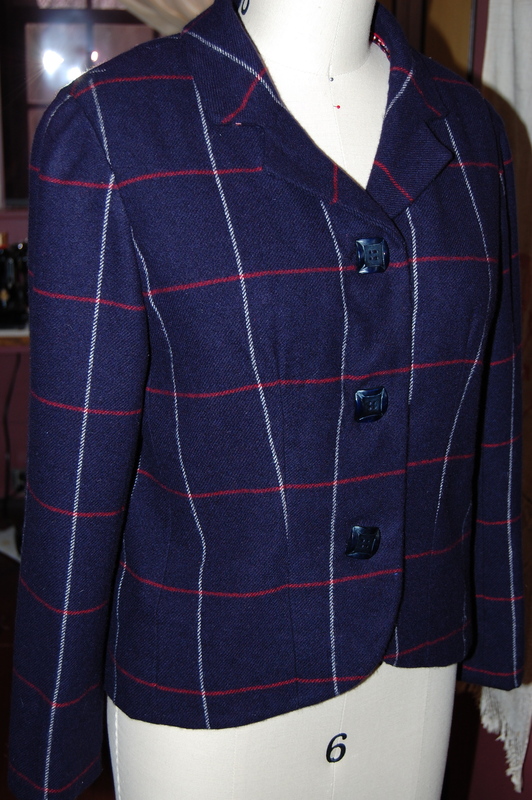 Of course, the lining adds more, but compared to the number of pieces in the coat I made two years ago, this is minimal! I am currently working on my muslin, and I am so excited to be starting this project. Thank you, EG, for allowing me to purchase this beautiful vintage fabric. I feel a great responsibility to honor this “something old” wool in a coat worthy of its quality and provenance. Can it really be that May will arrive in a few days? If that is true, then I am only about 2 months behind in my sewing schedule. But who’s keeping track? I’m happy that I have plowed through to finish my wool suit dress, even though it will immediately go into my cedar closet for safe storage until next Fall. 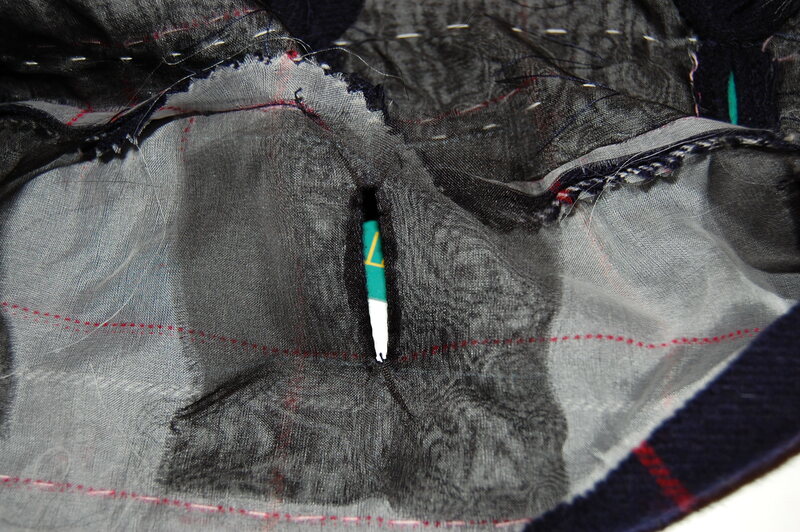 I underlined the collar with the lining fabric, and I made a working bound buttonhole instead of just sewing the button in place. Anything to make it more involved, right? 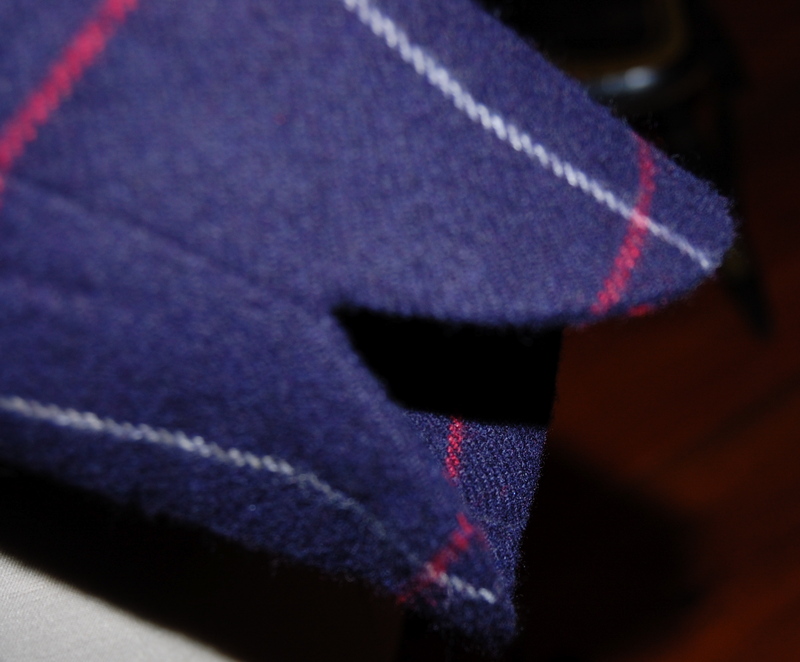 Detail of the button on the collar. 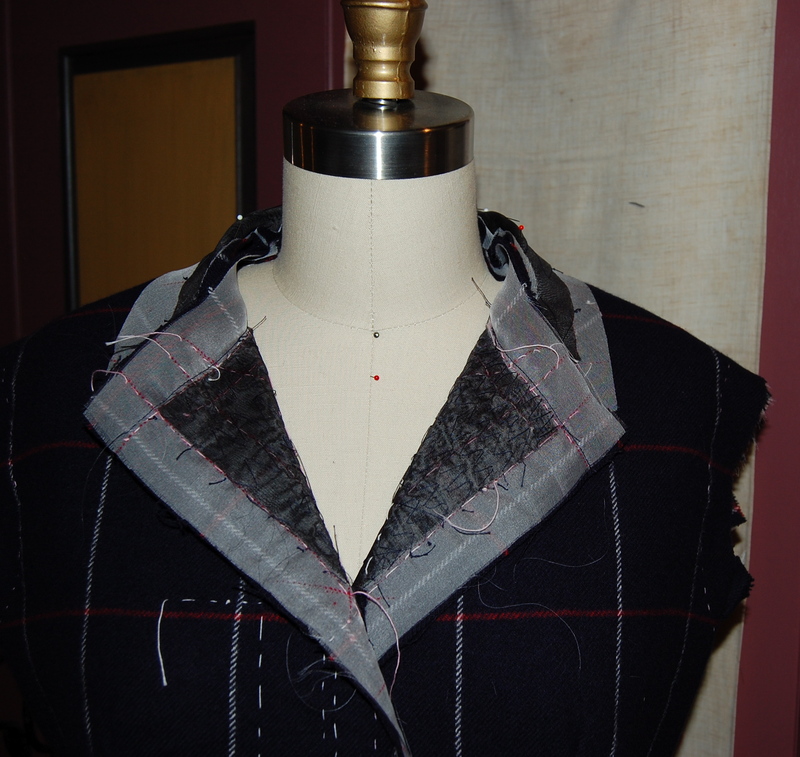 Lining the collar with silk charmeuse reduced bulk and helps it lay flat. From that point on, it was a straightforward sheath dress. I love a sheath dress. I think it is such a flattering silhouette, and very feminine. As far as I am concerned, one can never have too many sheath dresses (just as one can never have too many shoes). Speaking of shoes, I decided this outfit needed complementary shoes! What do you think? 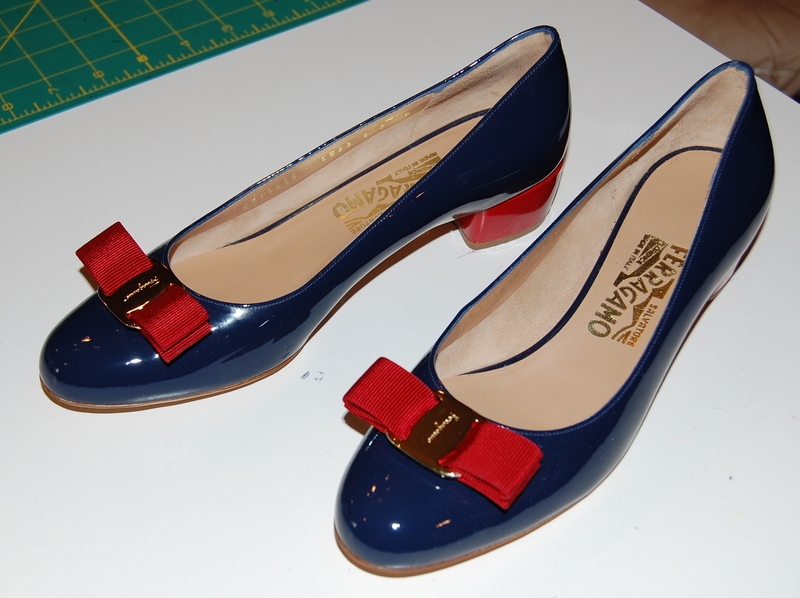 I wear a lot of red and blue, so I expect these shoes to serve me well! It turns out that even a simple sheath can take a lot of time to make when one is using couture techniques: underlining of silk organza; interior seams catch-stitched; hand-picked zipper; instead of facings, neck and armholes finished with lining-abutted edges, then pick-stitched for stability. The silk charmeuse lining in the dress matches the jacket lining and is an extravagance, I will admit. But it feels heavenly, and adds a fluidity to the dress which is a good match for the butter-soft cashmere wool fashion fabric. Shown with the jacket unbuttoned. And a partial back view. I am happy I added the collar to the dress, as that extra detail seems to help the dress stand on its own if/when I take the jacket off. Framing the face is always a good fashion decision, and I think the collar helps in that regard. So happy this is finished! I consider finishing this outfit a major accomplishment! So what’s next? Something easy or something more complex? Those questions to be answered soon, with this caveat: it will most definitely be something for Spring/Summer! 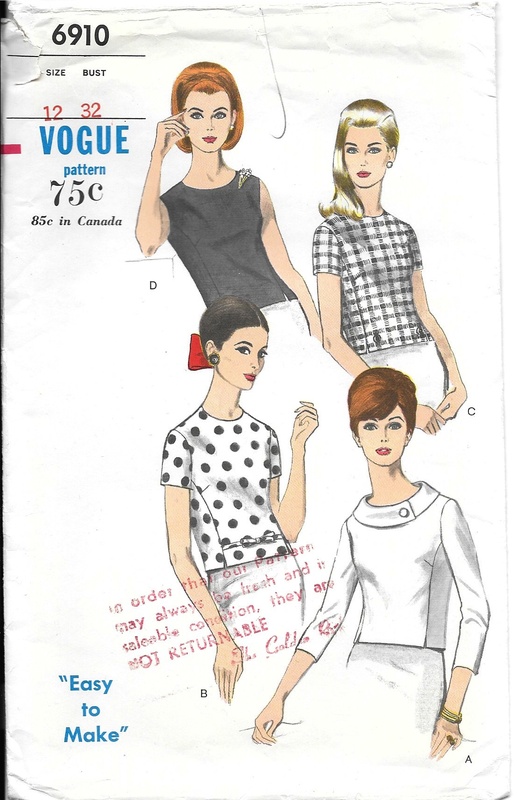 The New Vogue Sewing Book published in 1963 contained a “Couturier Supplement”. 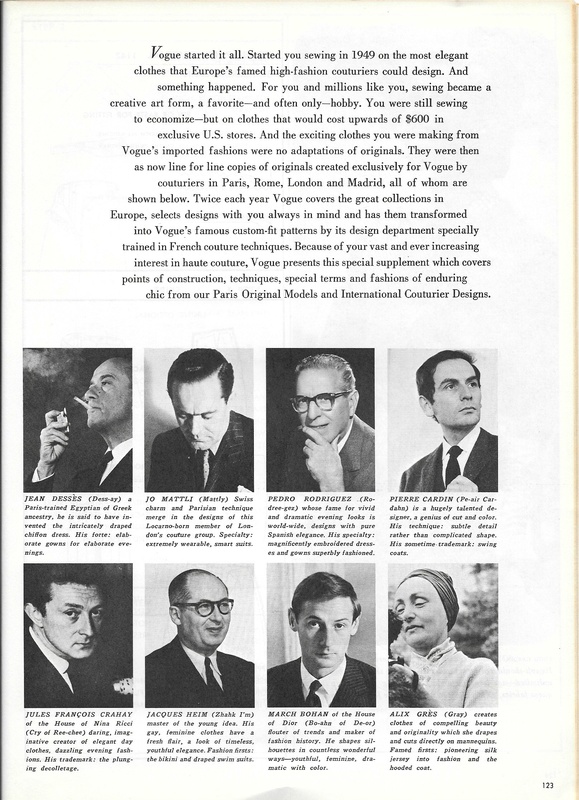 According to the Foreword in this magazine-styled book, “Only Vogue Patterns can bring you original designs from the Paris and International Couture houses, because of an exclusive arrangement with world famous designers.” One of the 17 designers featured in the supplement was Jo Mattli. Jo Mattli is second from the left on the top row. Click on the photo to see the image up close. 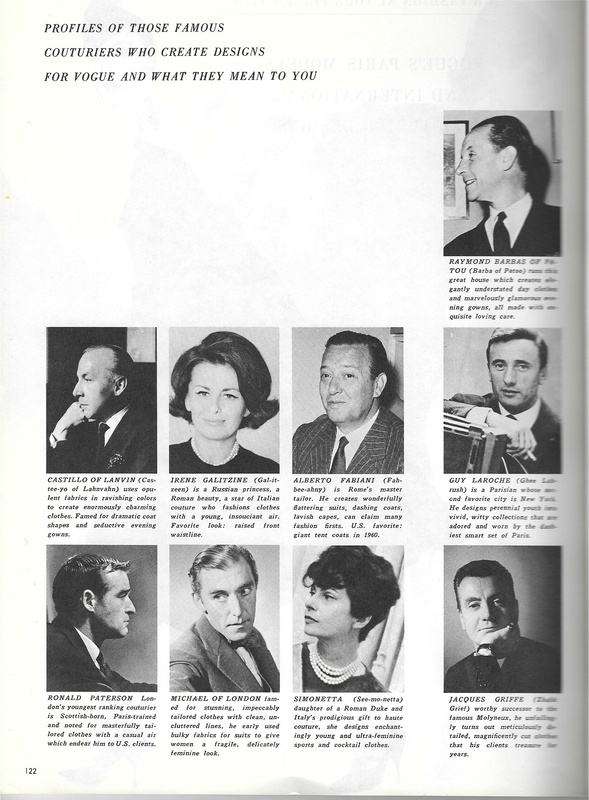 A quick look at the two-page spread on these designers shows a veritable who’s who of fashion design, with names very much still known today. Except for perhaps Jo Mattli. (Mattli was born Giuseppe Gustavo Mattli in 1907 in Locarno, Swirtzerland; he died in 1982 in England). He is absent from The St. James Fashion Encyclopedia, even though he was considered one of the “big ten” London couturiers in 1953, when London Society was busy readying for the coronation of Queen Elizabeth II. Perhaps it was his move into ready-to-wear in 1955 that relegated him to lesser status among the world’s great couturiers. This did not keep Vogue Patterns from recognizing his wide appeal to stylish women who appreciated his attention to fine detailing, and his expertise in creating practical, wearable and charming dresses and suits. As one of Vogue’s featured designers in their Vogue Couturier Design-labeled series, Jo Mattli made his mark. Indeed, even he recognized the value of being part of Vogue Patterns, saying “the royalties from these patterns had helped support his couture business” (from Wikipedia, the free encyclopedia). I would like to make this pattern again. The first time I made it, the fabric I chose was too heavy, but the fit and the styling were excellent. 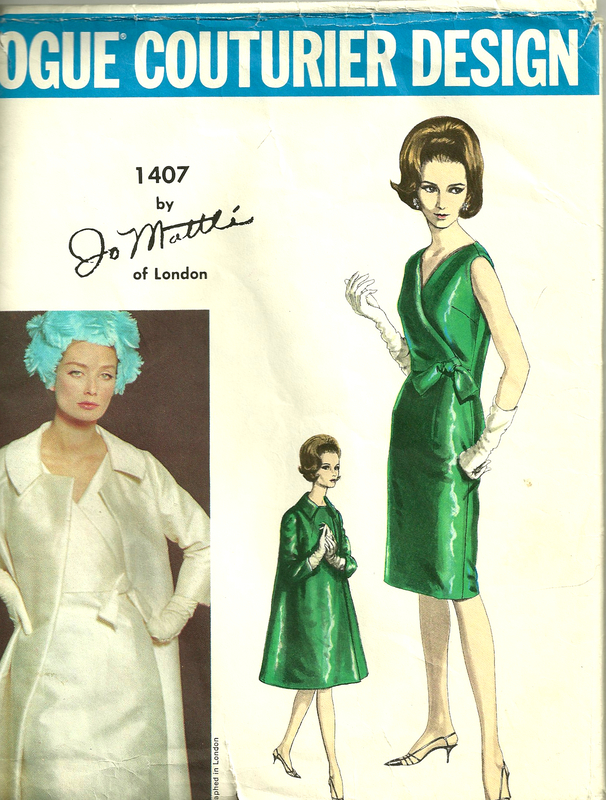 I still have plans to make the coat, to coordinate with the cocktail dress. And now with three “makes” under my belt, my appreciation for Mattli’s design and construction sense is growing. Not only that, I realized after going through my pattern collection, that I have two more Mattli patterns, each of which also displays his characteristic and interesting seam detailing. This is actually a one-piece dress, although it looks like it is a two-piece outfit. While the Mattli-designed jacket in my suit dress ensemble is certainly the star of the outfit, I am hoping the dress will have its own charms. After being out of town and away from my sewing all last week, I have now been able to turn my attention to the dress part of the outfit. I believe I have successfully combined two patterns (sheath dress and collared blouse) to create – what else? – a collared sheath! I was still adjusting the fit when I took this photo. Hopefully it will not look like a bag when I actually wear it! 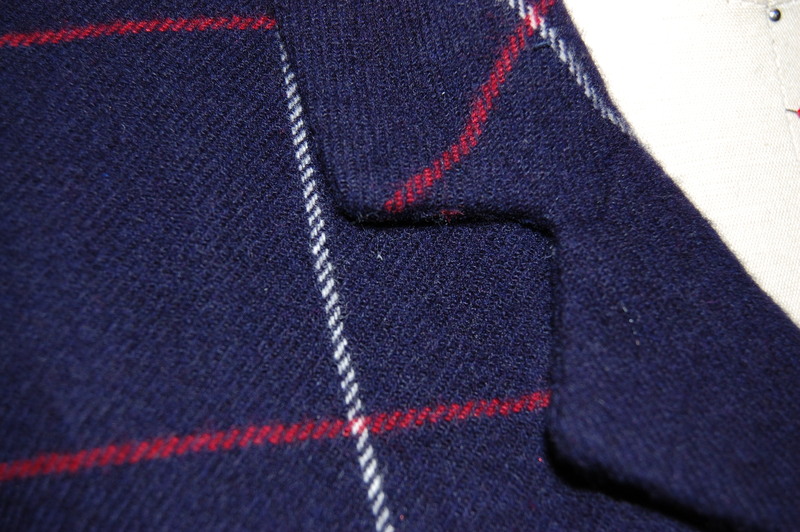 This shows the curved detail on the edge of the sleeve. This shows not only the added curve to the left collar end, but also how much width I had to remove from the collar pattern. And here is the right collar section. I hope that Jo Mattli would approve of a dress being paired with his jacket. He would probably refer to it as a “slimline afternoon dress” were he alive. I have no doubt he created many such beautiful dresses in his lifetime. It is a fairly well-known fact that making a classic French “Chanel-like” jacket takes about (or at least!) 70 dedicated hours of sewing time. 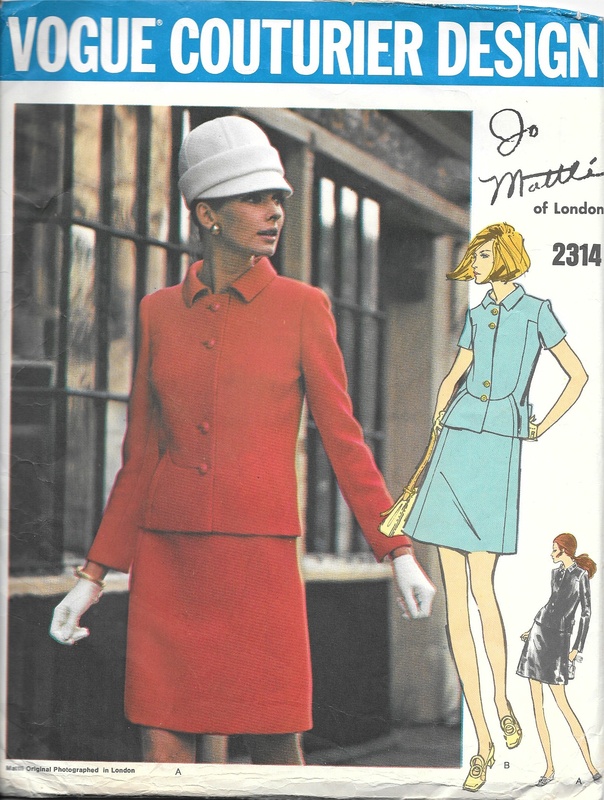 I did not keep track of the hours I spent on my Jo Mattli-designed jacket, but I am guessing that it rivals – in time spent sewing – both of the classic French jackets I have made. However, I am not complaining. I would commit to it all over again. 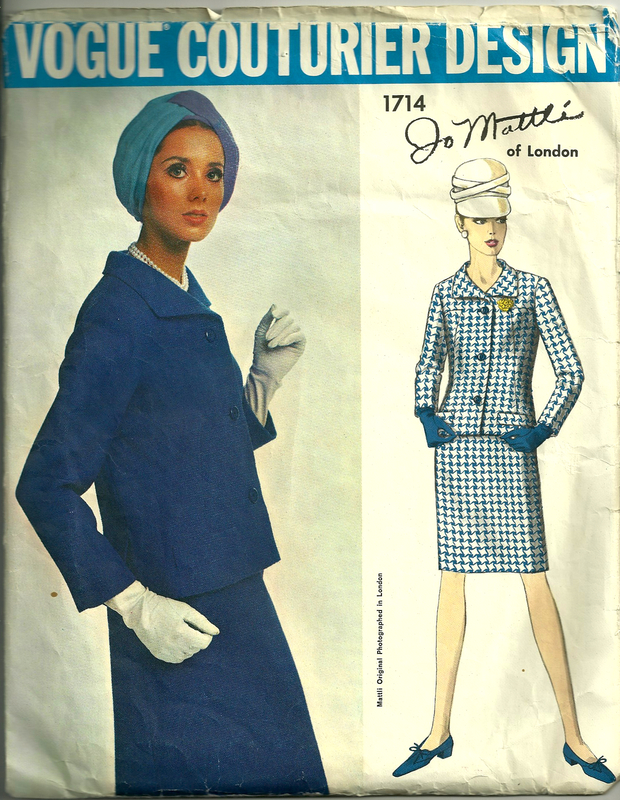 And just think – I still have to make the coordinating dress for this jacket! But it is finished, and happily so. One of the true joys of sewing is the ability it gives us to make some stylistic changes, add embellishments if desired, and use our heads to determine what works and what doesn’t work for the fabric we are using and the intended usage of our garments. While I did not make any stylistic changes to this jacket, I did add my own “dressmaker details” while stitching my way through this project. But first a few more regular details, picking up where I left off in my last post. 1) To finish the underside of the bound buttonholes, I used organza patches. I have started using this method all the time, as it makes such a neat, fool-proof finish. The silk organza patch is sewn onto the right side. After cutting and clipping the corners – carefully! – you turn the organza and you have a perfectly finished opening to back up to your bound buttonhole. Then it is easy to sew the two sides together very neatly. 2) Even though the entire jacket is underlined with silk organza, I added another layer of silk organza “interfacing” to the hemline, as directed in the pattern instructions. 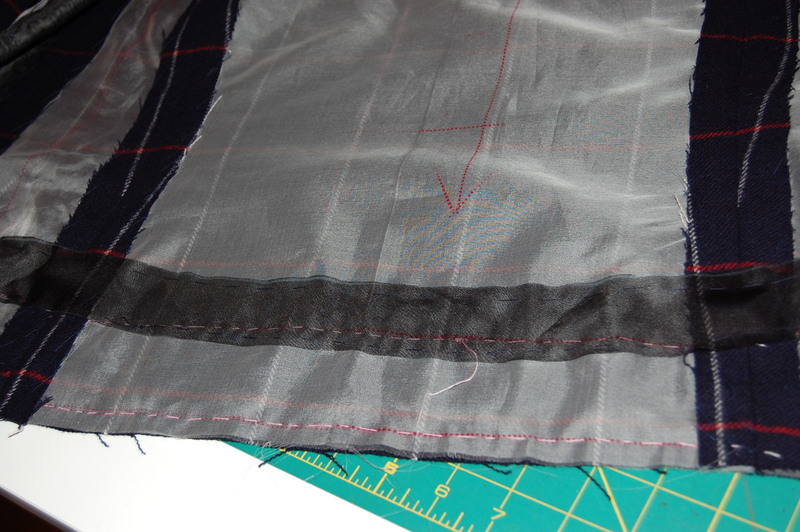 I always like to baste the hem along the bottom edge to stabilize it until the jacket is complete. 3) I used black “cigarette” which I purchase from Susan Khalje’s store for the sleeve headings. I doubled and graduated the two layers to achieve the correct amount of sleeve–cap cushioning. Unfortunately, no photos were able to pick up the details in this – too much black and navy blue and not enough contrast! This is what the “cigarette” looks like. One of the interesting construction details in this design is the notched collar. 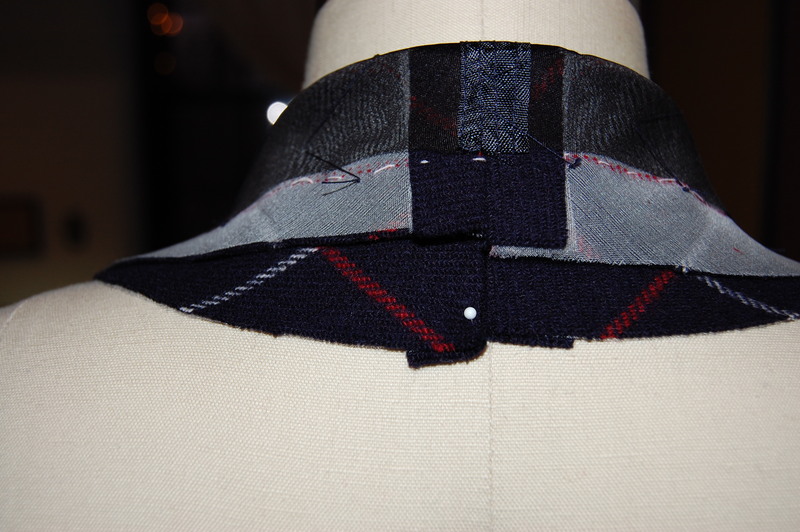 Most notched collars are seamed at the “notch,”,joining the upper collar and the front facing and forming a “V”. 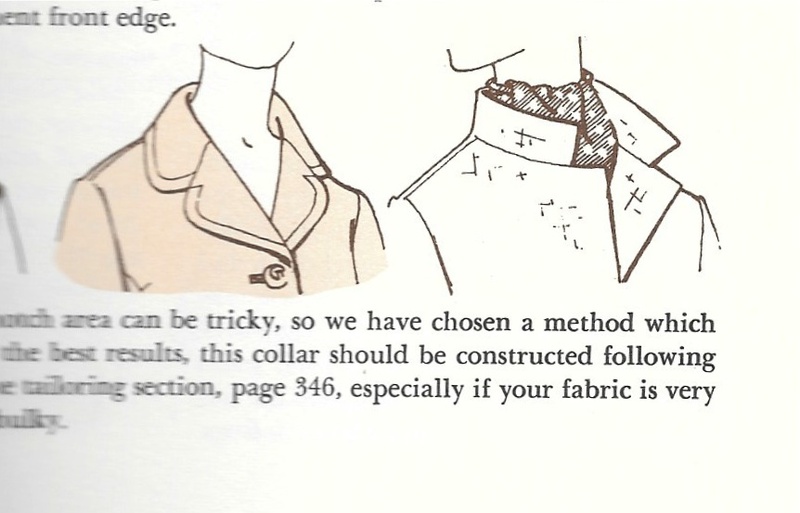 This diagram from The Vogue Sewing Book. c. 1970, Butterick Division, New York, New York, shows a classic notched collar. 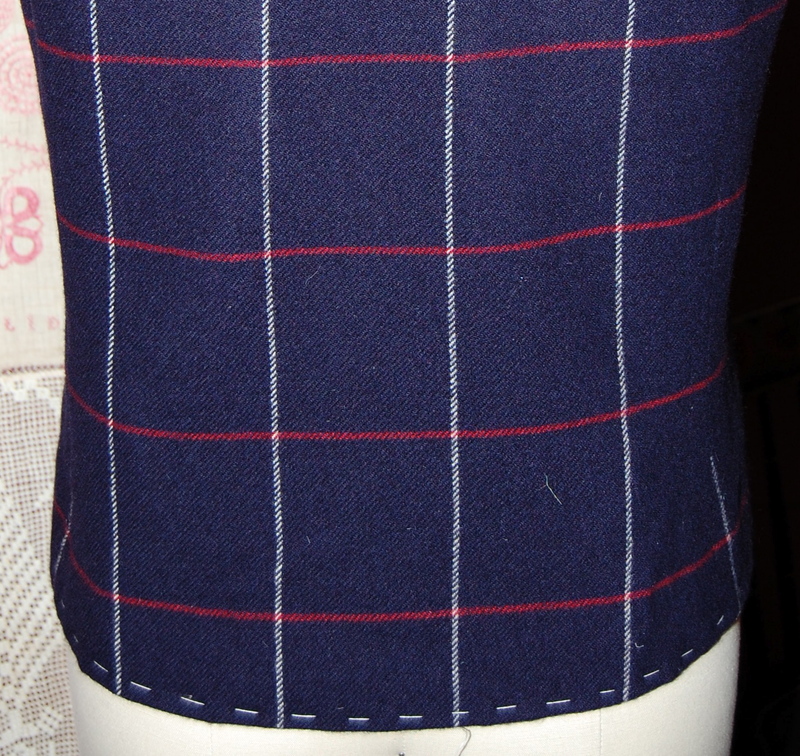 Here is the seam at the back upper collar. 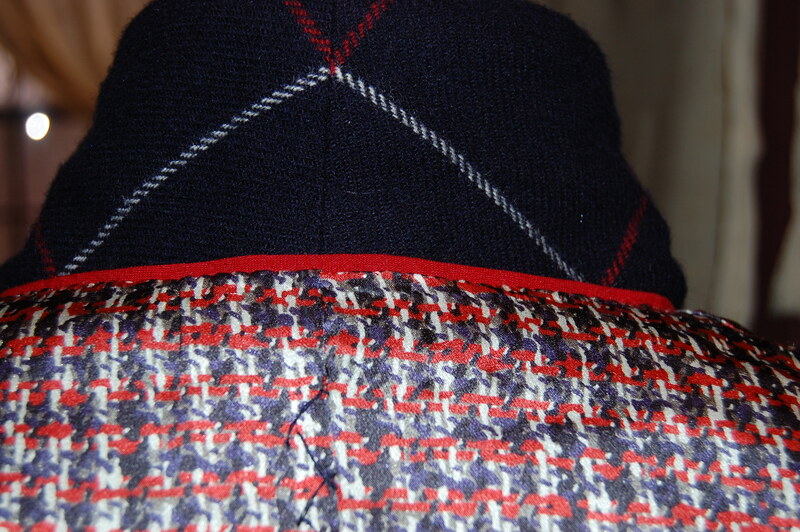 While I was contemplating the lining for the jacket, I thought it would add just a really special touch if I did a interior bias piping to set off the lining where it joins the jacket along the front edges and around the neck. Normally this is made out of silk, but I did not have any light-weight silk which was the correct color of red. However, I did find some scraps left over from a red wool challis maternity dress I made for myself over 34 years ago. (Yes, you read that correctly!) Very light in weight – and the exact color I needed – made it the perfect fabric for this detail. 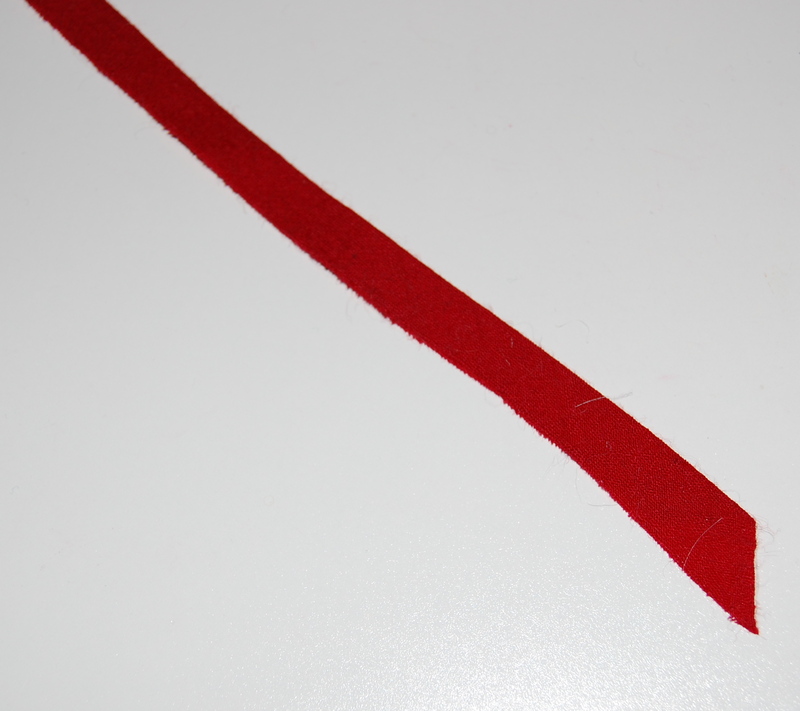 I cut a bias strip one inch in width and folded it in half. I guess this proves it pays to save scraps!? This is such an easy flourish to do, and it adds such a professional touch. 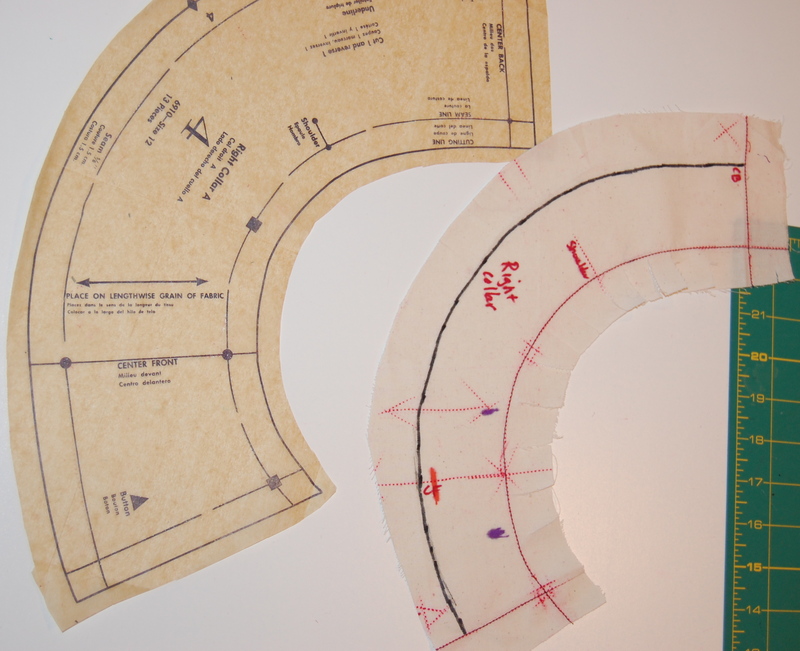 Adding this flat “piping” is quickly becoming a standard for me when I make jackets or coats. 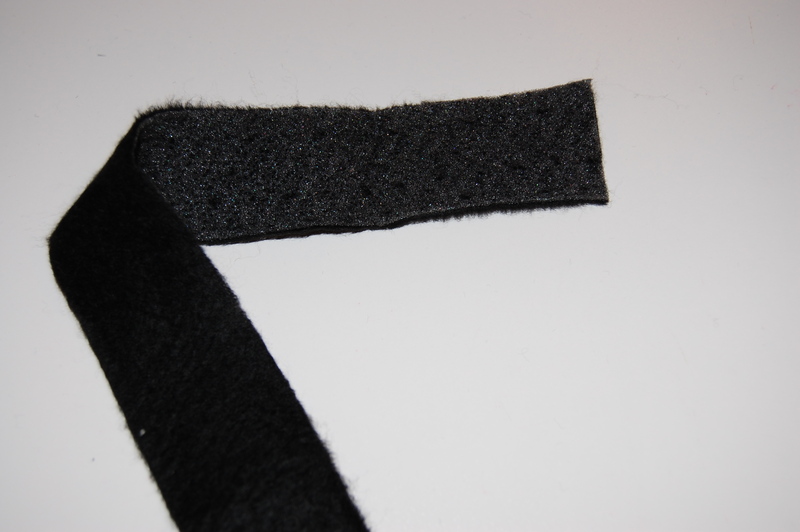 Once you have your bias strip cut, folded in half and pressed, all you need to do is baste it in place along the line where the lining will be hand-stitched to the jacket interior. The bias “piping” basted in place. Click on the photo to see it close-up. Here is the back neck edge. I really like this extra flourish. Now – true confessions! After top-stitching the sleeve edges, the collar and most of one front, I decided I did not like it. I thought it detracted from the windowpane of the fabric, so I took it all out. 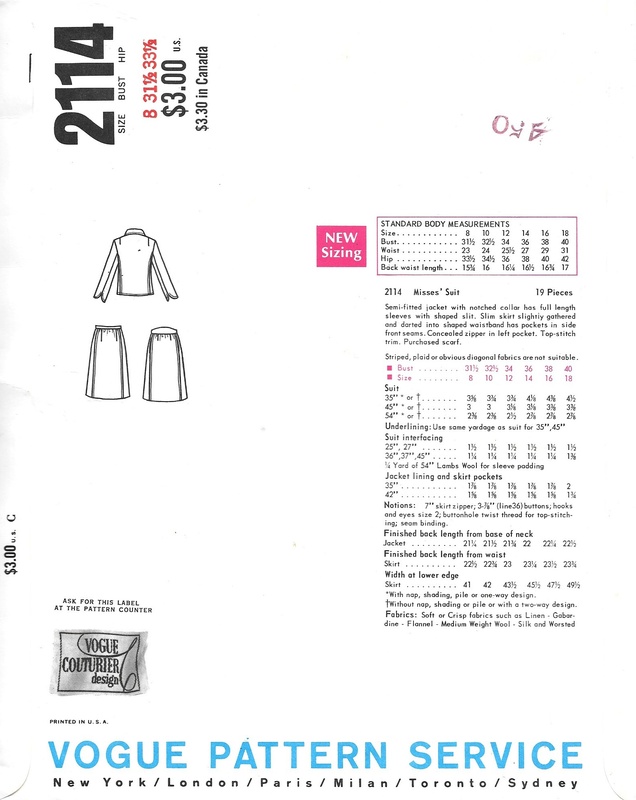 NO top-stitching – for me – on this jacket! Speaking of the dress (and matching more plaid) . . . I never imagined I wouldn’t have this entire ensemble completed by about now. So – it looks like I’ll still be sewing on wool when Spring arrives. Hopefully by the time Spring departs I will have moved on to something more seasonal! How can something which is taking so much time to make still be so much fun? It must be because of all the delightful details to consider, to execute, to alter, and to research. 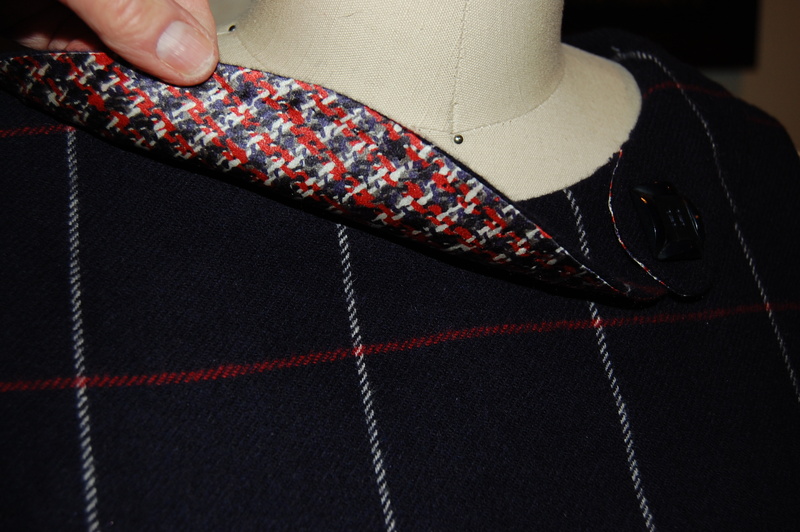 One of the most important details for the jacket of a project like this is the choice of buttons. 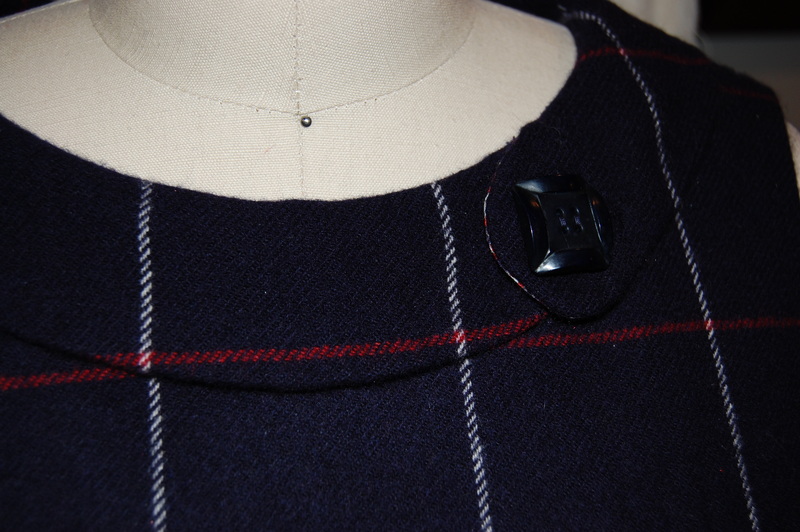 One of the advantages of having my blue windowpane-checked cashmere for a couple of years before sewing with it has been the opportunity to find just the right buttons. When I came across these buttons in an Etsy shop, I knew they would be perfect. These buttons are 7/8″ square. The size is right, as is the shape – which picks up the “square” in the fabric. How I was so lucky to find them in navy blue, I’m not sure. Additionally, and this is very subtle, but the depth of the buttons allows a curvature to each edge, which mimics the curved front edge of the jacket and also the curved cuffs. Of course, when making bound buttonholes, one must have the buttons in hand before beginning the project, since the buttonholes are one of the first details to execute. 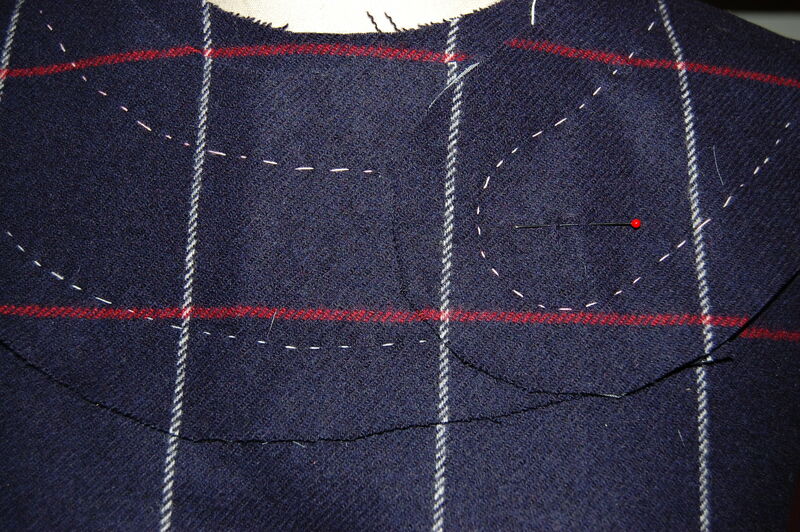 One can never have too many markings basted in place for bound buttonholes! Although I have yet to work out the logistics, I am thinking that I can turn the collared blouse with the one-button detail (lower right) into a sleeveless sheath dress. The button may not really show (I think) unless I take the jacket off, but I kind of like the subtlety of it all. 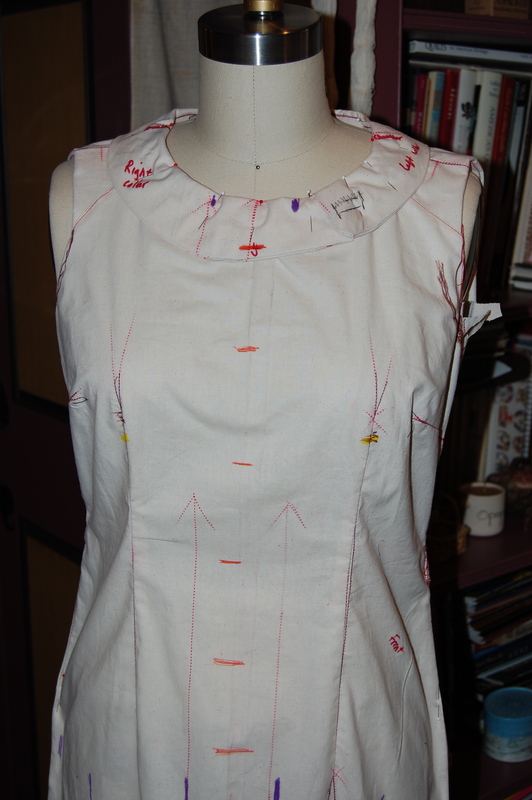 Once I make a muslin (toile), I will have a better idea of how it will look, so stay tuned! 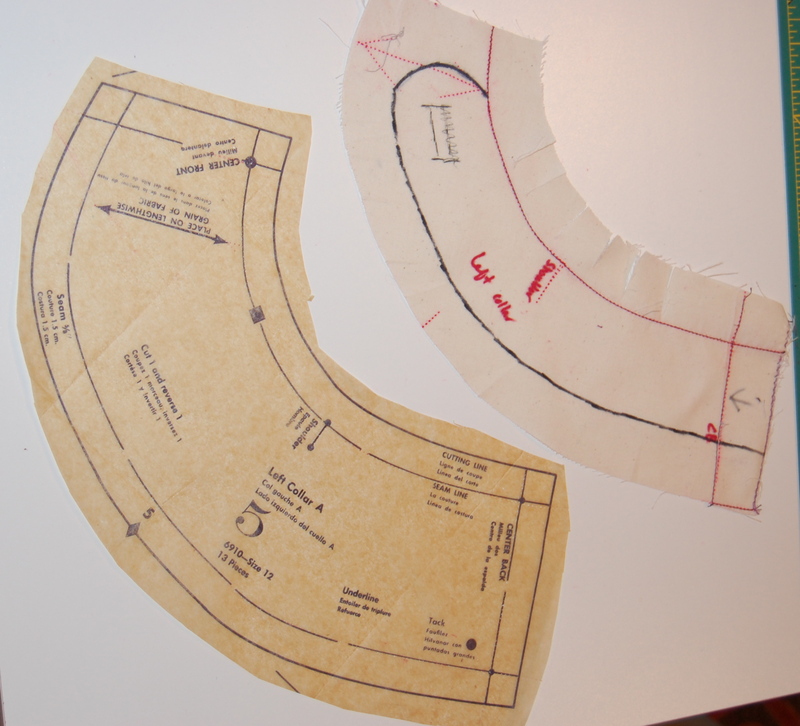 One thing I do know, is that such a collar on the dress will need to lay very flat, with no bulkiness. One way to achieve that will be to back it with the silk charmeuse I will be using for the jacket and dress lining instead of backing it with another layer of wool. So what am I using for the lining? When I bought the lining for my color-blocked coat last winter, I purchased extra yardage of the silk charmeuse (from Britex). Now I can’t remember what my reasoning was, but once I got it home from San Francisco and I saw how complimentary it was with the navy blue cashmere, I knew I should save it for this project. Fortunately, I have enough of it to line both the jacket and the dress. Not that anyone is ever going to see the lining in the dress, but I’ll know it’s beautiful – and oh, so wonderful to wear! 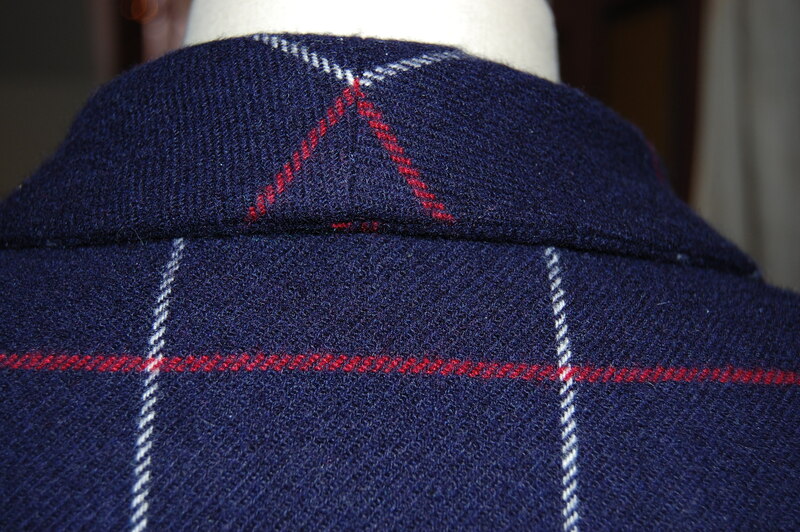 There are always lots of details in the construction of a rolled collar. At the risk of boring some of you, I’ll quickly go over a few tricks I learned from Susan Khalje last year when I made my color-blocked coat. 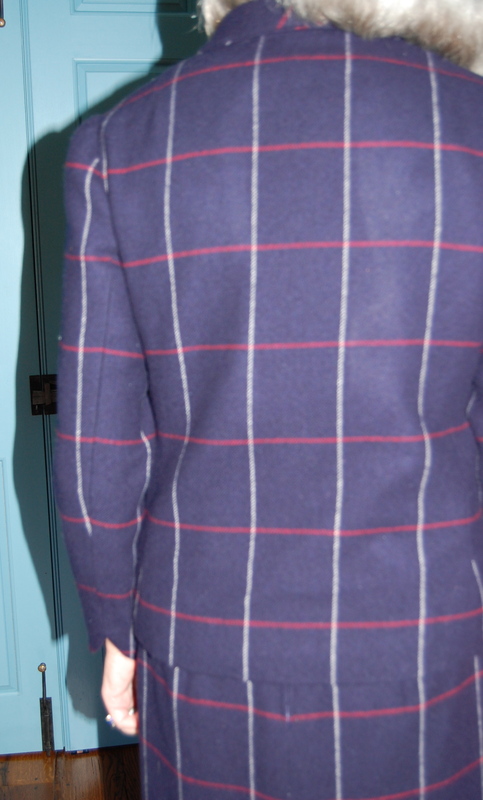 First, here is a picture (by request from some of you) of the lightly pad-stitched and interfaced jacket front. 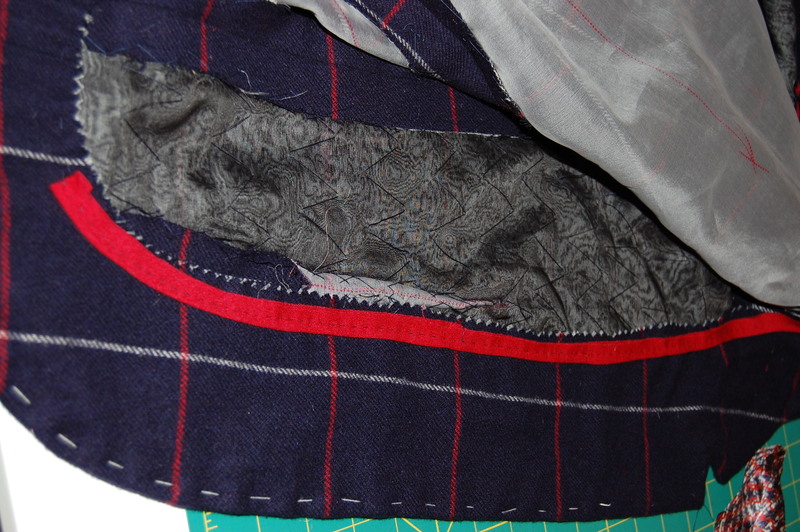 Here, too, is an inside look at the underside of the three bound buttonholes. 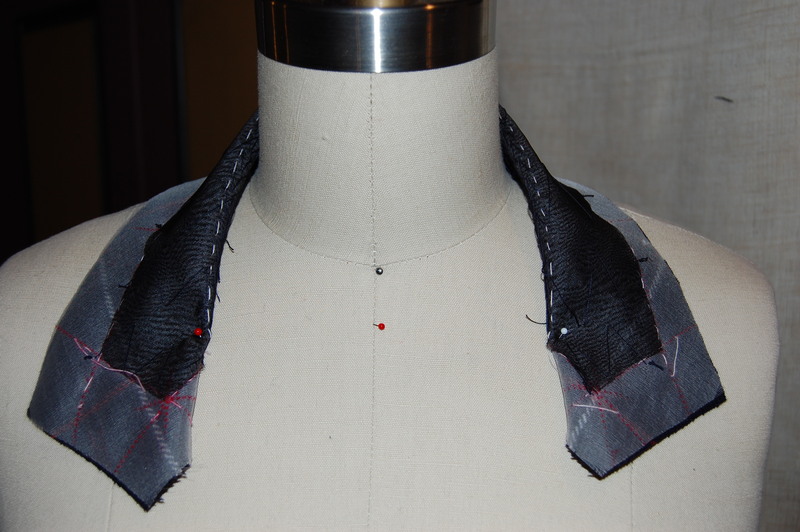 The undercollar is also interfaced with black silk organza. 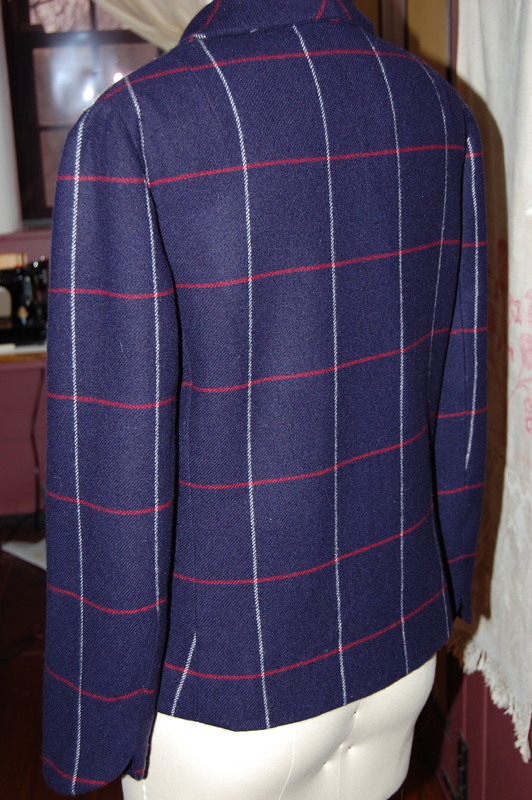 It is basted onto the body of the jacket in order to establish the roll line. Once I marked the roll line with pins, I removed it and basted along the roll line in preparation for heavy pad-stitching of that section. Establishing the roll line of the undercollar. 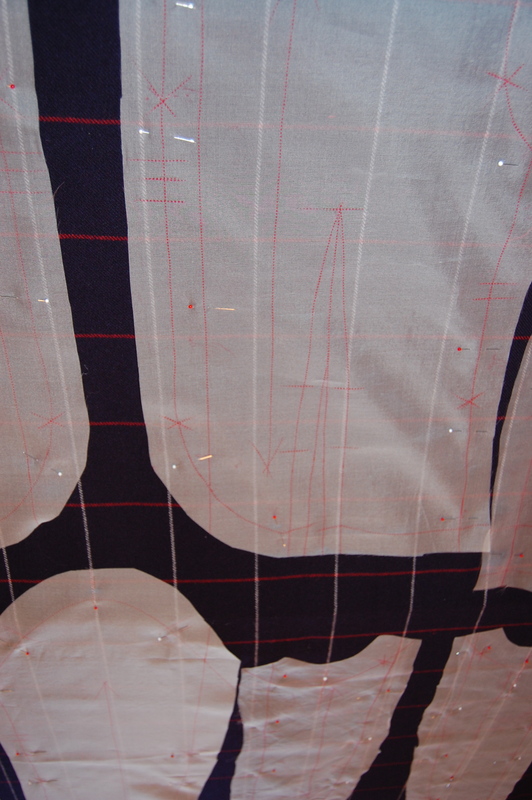 The roll line is marked with pins; then I basted along that pin line. Once I finished the pad-stitching (impossible to see here on the black organza), I then placed it on the dress form, pinned it in place and steamed it. This process reinforces the “memory” of the roll. A dress form is indispensable for steaming the undercollar. You can see the basted roll line in this photo. The back of the undercollar after steaming. 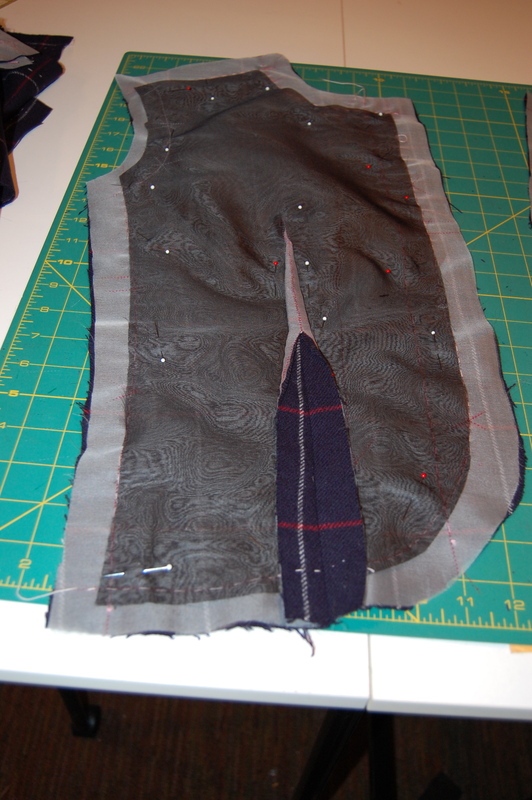 As I make progress on this jacket, I am reconsidering the amount of top-stitching I want to do on it. 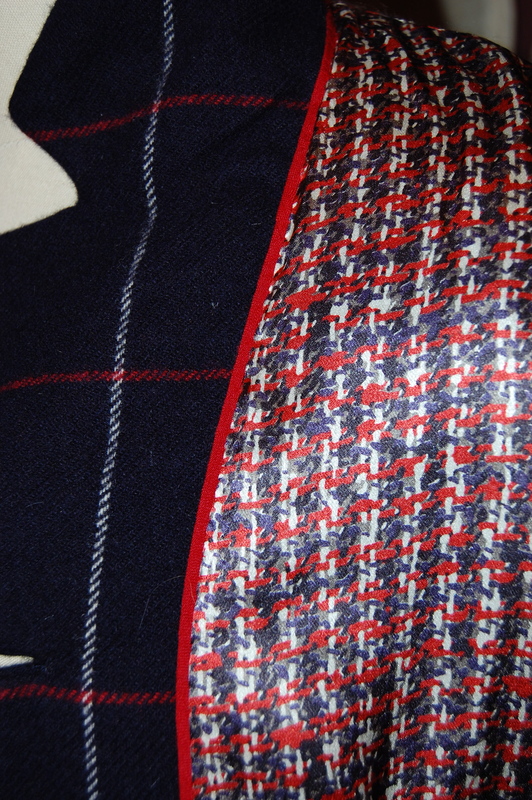 The pattern calls for double rows of top-stitching along seam lines, front edges and sleeve edges. I plan on modifying this somewhat. This diagram clearly shows the extent of proposed top-stitching. I will definitely not be doing this much! Top-stitching always makes me nervous. It may be my least favorite part of sewing. 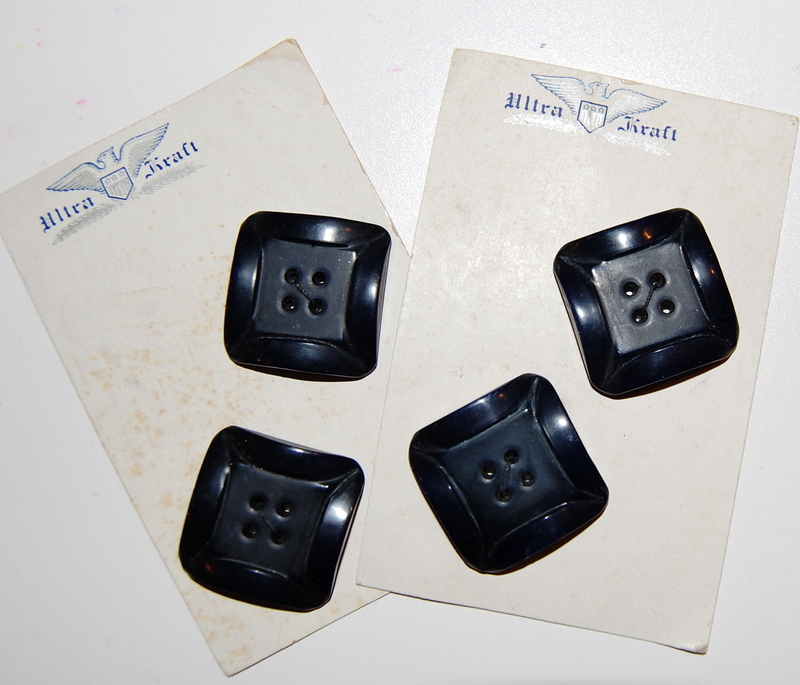 I’d rather sew on buttons than top-stitch! Let’s see how well I do with it – in my next post – before I can get back to more fun-stitching. 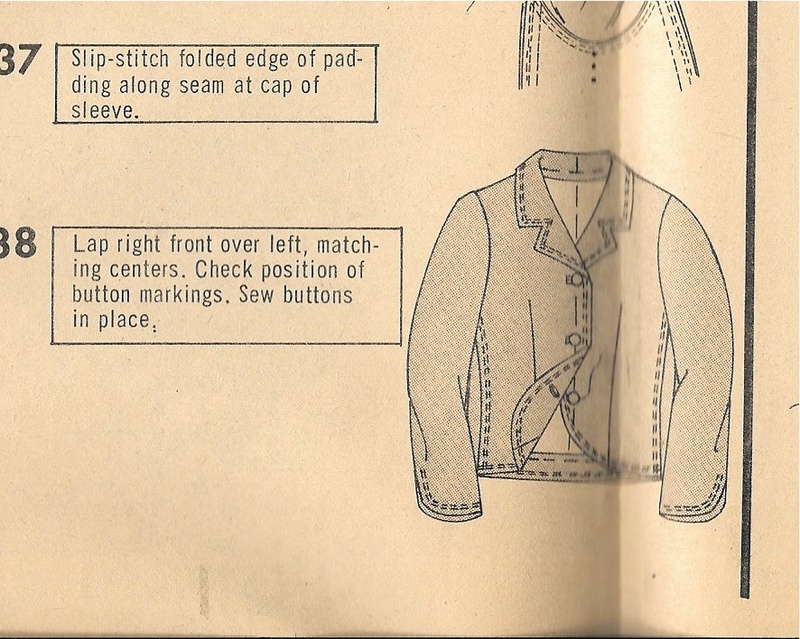 This diagram of the jacket back better shows the interesting treatment to the cuff edges of the sleeves. Click on the picture to see a close-up view. I admired this pattern on a regular basis while it was listed for sale in the Vogue Catalogue at my local fabric store, but in the end I didn’t buy it. That hefty $3.00 purchase price, and not knowing for sure that I would actually end up making this outfit, kept me from its purchase. Now I am not nearly as practical – or maybe I have learned from experience. One must get these things which speak to them while they can! So when I found this pattern a couple of years ago on eBay, I knew it was time to fulfill a long-delayed dream (at a much higher price than $3.00, I might add!). 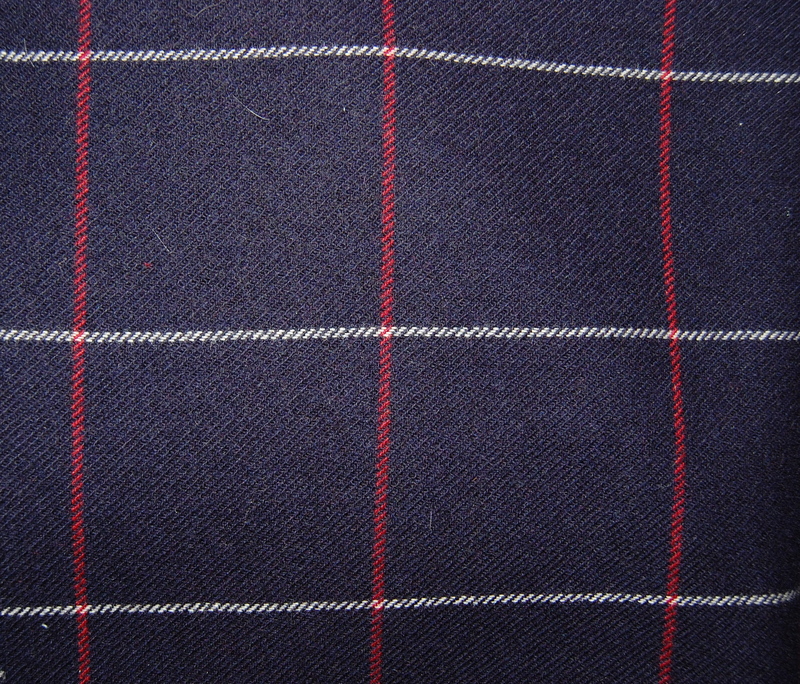 Shortly thereafter I found this navy blue, windowpane-check cashmere fabric on one of my trips to Britex Fabrics in San Francisco. 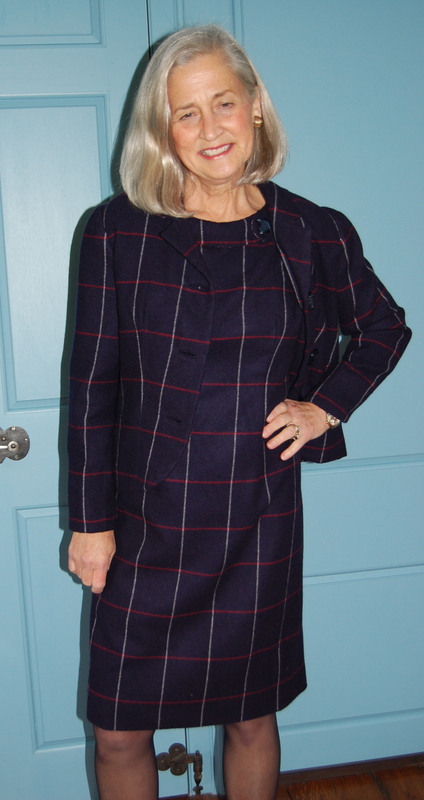 I purchased what I was sure would be ample yardage to make a two-piece suit (jacket and skirt, with this Jo Mattli design in mind) and to compensate for matching the plaid. Then I set it aside, knowing that the time to start this project had to be right. The feel of this wool is best described as like soft butter. I am so glad I waited. As I have grown in my sewing and dressmaking skills (with so much credit in that arena attributed to what I have learned in classes with Susan Khalje), I came to see this fabric and this suit taking on a slightly different appearance. I knew I wanted to make the Mattli jacket, but more and more I felt that this fabric was too special to mix it up with a blouse, no matter what color or how simple that blouse might be. 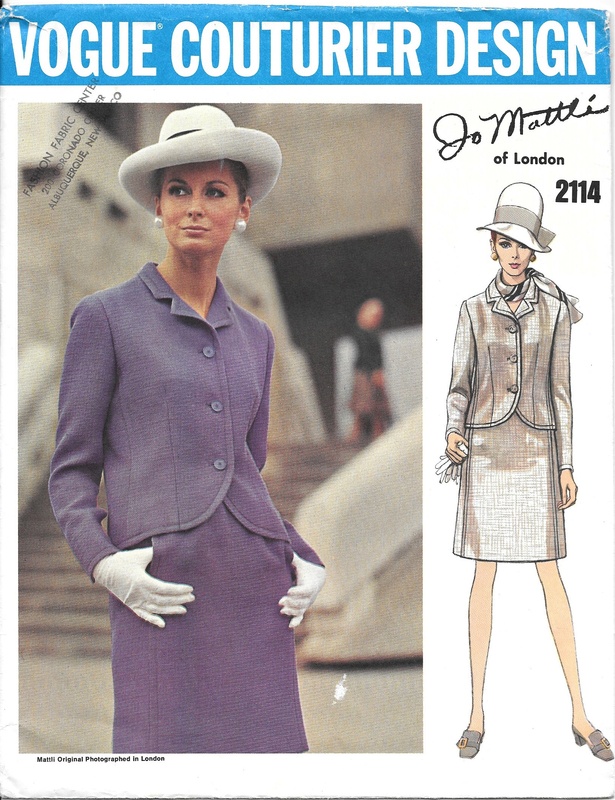 I began to envision the jacket paired with a sheath dress – in effect, a classic 1960s’ inspired suit dress. But would I have enough fabric? Britex has always been very accommodating when cutting yardages for me, adding inches to compensate for the layout of plaids and designs, and simply being generous in adding a few inches to my requested amount. (I have found most fine fabric stores to be similarly inclined – Mendel Goldberg, for example, also adheres to this customer-friendly practice. Have you found this generally to be true as well?) Well, those of you who read my blog know that a little shortage of fabric has never kept me from my intended goal. Of course, I would have enough fabric… And so I do, especially with those few extra inches courtesy of Britex added on! Fitting the muslin (toile) for the jacket took more thought and planning than usual. Much of this is because the pattern I found on eBay was actually one size smaller than what I usually buy and wear. For some reason I find it easier to size down patterns than size them up, so I’d rather, if necessary, start with a too-large pattern than one too small. Adding length and width to the body of the jacket, fitting the sleeves (which also needed a little more circumference) into those new dimensions, and adjusting the front/neck facing, which is part of the notched collar, was quite a puzzle. It took days! I transferred my final changes from the muslin to silk organza, and then I was in business. I love a challenge, and it’s a good thing I do! Do you know how nerve-racking it is to make sure all your plaid lines match up vertically and horizontally? 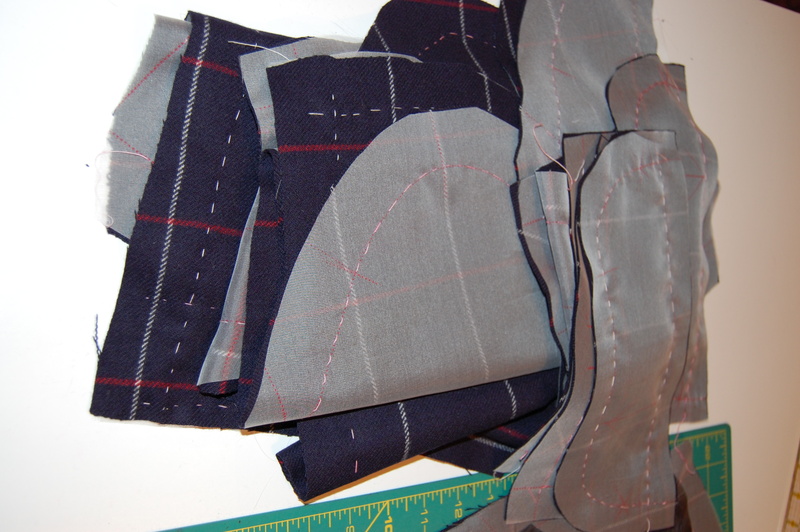 Also, I knew I could lay out only the jacket pattern pieces initially. There are two reasons for this: one is that I have not yet determined which sheath dress pattern I want to use. The other is that the plaid on the dress is going to have to match – perfectly – the plaid in the jacket horizontally first, with the vertical match being as close as it can be, taking into account darts and the curves in the body of the dress. So – I have to finish the jacket before I can lay out the dress. That fortuitously gives me some more time to think about the dress, which is still taking shape in my mind! I chose to use white silk organza underling rather than black, as it is much easier to see the windowpane lines through the white, and easier on the eyes, too. This photo better shows my markings on the silk organza underlining. With all the silk organza underlining basted onto the wool, I am ready to sew. A pile of prepared pieces! But hold the horses there, Fifty Dresses! 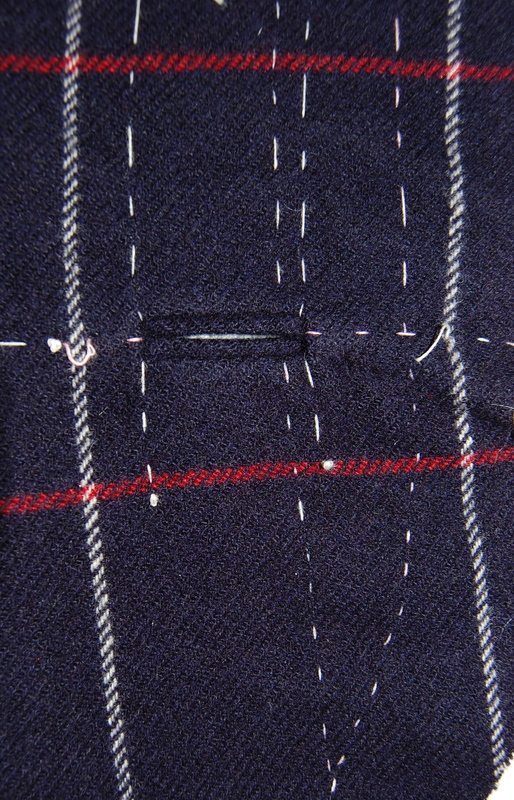 First, there are interfacings to be pad-stitched and bound buttonholes to be made. I am using black silk organza for the interfacing. This is what I did on my color-blocked coat, under Susan Khalje’s tutelage, and I was delighted with the results! It is clear there is no hurrying this jacket, nor should there be. Some dreams just take a little more time.